The 1918 draft card of Frederick Tietz Jr., the original owner of REAs "Oceanside Wagner." The $1 million card appears on FOX Business News 106 years after Tietz obtained the card in Richmond Hill, Queens. 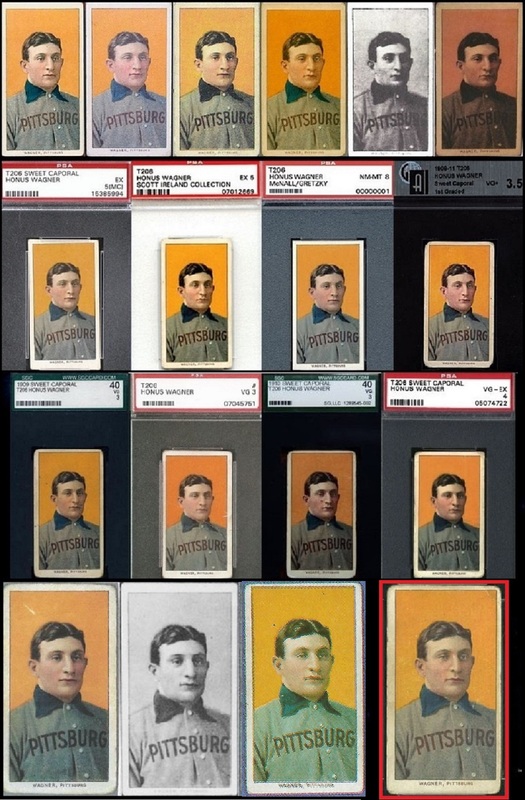 REA sold the "Cooperstown Wagner" in 1995 (left) but the same card was re-named and re-sold as the "Chesapeake Wagner" by SCP in 2014. But despite the well-documented provenance of that card, SCP’s David Kohler, who actually purchased the “Cooperstown Wagner” from REA in 1995, never mentioned the previous sales and decided to re-name the Wagner to reflect the background of the card’s most recent owner (and SCP consignor) from Chesapeake, Virginia. In doing so, SCP and Kohler buried a chapter of the Wagner card’s actual provenance in an attempt to make the card appear fresher to the market. Unlike paintings and fine art bolstered by detailed provenance records, the auctioneers selling the “Mona Lisa of Cards” rarely document the Wagner’s true chain of ownership. It appears that REA is continuing this tradition by leading collectors to believe that the “Oceanside Wagner” was discovered in a basement in 2008. The existence of REA’s current “Oceanside Wagner” was first made public in a 1993 issue of Sports Collectors Digest. The report published in SCD stated, “Another T-206 Honus Wagner card has surfaced in the hobby, this one in the New York area.” The news came from Keith Pearsall who was representing his family after inheriting the collection of tobacco cards his grandfather had shown him in the 1960s. At the time of the 1993 report, SCD said the “Pearsall Wagner” was not for sale and that the family wanted to exhibit the treasure that could actually be traced back to its original owner. The discovery of the "Pearsall Wagner" was reported in SCD in 1993 (left). In 2008, the card sold for $791,000 and was graded "VG 40" by SGC (center). The same card was re-graded "PSA-3" and is for sale at REA (right). A decade later in 2004, an article was published in the Long Island Herald revealing how the Wagner card was originally discovered when “Pearsall and his sister, Susan Farrell, moved their grandfather’s belongings from their parents’ Rockville Centre home in 1992.” The tobacco cards were revealed when “an old box fell apart in Pearsall’s hands” and he recognized the famous Wagner card. Pearsall then took the Wagner to a local card shop owned by Norman Siegal who verified it was the real deal. Writer Joseph Kellard recalled his 2004 bank-vault interview with Keith Pearsall on Facebook (left). Antiques Roadshow appraiser Philip Weiss (center) sold collector Eric Brehm (right) the "Pearsall Wagner" for $791,000. Auctioneer Philip Weiss (left) conducts the live sale for the "Pearsall Wagner" in 2008. Owner Keith Pearsall (right) sits in the audience as a bidder in the back of the room raises his paddle for a $600,000 bid. Many owners selling their Wagner cards choose to remain anonymous in auction listings and REA makes no mention of Eric Brehm’s purchase of the card from Weiss in 2008. Brehm re-entered the hobby in 2006, after a 20-year collecting hiatus, and focused on the T-206 set also known as “The Monster.” Of the classic tobacco issue, Brehm told fellow collectors on Net54, ” It is to baseball card collecting what Mount Everest is to mountain climbing: it is there, it is big, it is beautiful, it is mysterious, it is the king of its domain, and it is very, very challenging. I can’t imagine I would ever be able to collect the whole set but it is fun to work on it anyhow — the journey in this case being perhaps more important than arriving at the summit.” Having acquired his Wagner in 2008, Brehm reached his personal Everest quickly and after owning the card for the past seven years stands to make a substantial profit on his original investment. REAs Brian Dwyer, appeared with the Wagner on ESPN’s Mint Condition calling the Wagner “one of the finest examples in existence” and claimed that “only four cards are rated higher.” REA and Dwyer may be accurate in respect to the Wagner cards graded by SGC and PSA, but they fail to reference the overall population of cards in relation to the “Oceanside Wagner” and go too far in stating the card is “one of the highest grade examples.” Hauls of Shame has documented images of at least 60 copies of genuine Wagner cards and of those examples there are at least (14) examples in better condition and (2) in at least the same condition as the card being sold by REA. ( T206Resource.com has an online gallery showing 43 examples of the Wagner card). 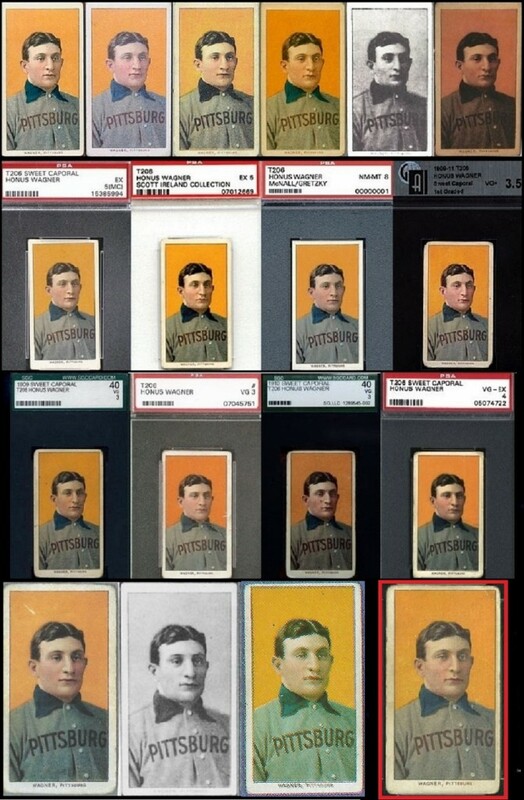 Wagners in better condition than "Oceanside Wagner" (bottom row in red): (Top Row l to r): 1. )The Met's Burdick Wagner; 2.) Baseball Hall of Fame ; 3.) Larry Fritsch; 4.) Jacobs-Mastro-Goode Wagner 5.) "Gelman-Shanus Wagner"; 6.) Unverified copy-1999 Mastro ad. (Second Row l to r) 7.) "The Jumbo Wagner" PSA-5 (MC); 8.) Scott Ireland's PSA-5; 9. )The trimmed "Gretzky-McNall Wagner" 10.) Frank Nagy SGC 40 VG; (Third Row l to r) 11. );"Miceli-Forman-Cohen Wagner" SGC VG-40; 12.) "MastroNet Wagner" PSA-3; 13. )The "McKie-Halper-Finkelstein-Goodwin Wagner" SGC VG-40; 14.) "Drier-Tull Wagner" PSA-4/SGC 50; (Bottom Row l to r) 15.) Sotheby's sale 1992; 16.) "1977 Trader Speaks Wagner" (w/Piedmont back); 17.) "1983 Beckett Guide Wagner"
The high-grade Wagners that outshine the REA example include museum pieces like Jefferson Burdick’s card at the Met and the Hall of Fame copy purchased from Barry Halper in 1998. Others are buried in prominent collections owned by Larry Fritsch’s family, New York collector Corey Shanus, a west coast collector who owns the Mastro-Goode Wagner, Vermont collector Scott Ireland (who owns a PSA-5) and a PSA 4/SGC 50 example owned by movie mogul Thomas Tull. Three other SGC VG-40 examples of the Frank Nagy, Tom Miceli and Fred McKie Wagners join a PSA VG-3 card sold by MastroNet in 2000 to comprise a group of cards in comparable condition. In addition, an ungraded Wagner sold by Barry Halper at Sotheby’s in 1992; the “1977 Trader Speaks Wagner” (w/Piedmont back); and the “1983 Beckett Price Guide Wagner” all appear to be in better condition than REA’s Wagner which has a small crease. An argument could also be made that all of these cards mentioned are in better condition than the trimmed PSA-8 “Gretzky-McNall Wagner” which should be designated with the lowest “Altered/Authentic” grade. REAs Rob Lifson (left) and his partner Bill Mastro (center) defrauded Brian Seigel when they sold him the trimmed-PSA-8 "Gretzky-McNall Wagner" (right) in 2000. Back in 1996 at Christie's Lifson bid against Mastro and took home the fraudulent Wagner card for $651,500. Lifson said he was only bidding for his friend, Mike Gidwitz (right). The last time REA sold a million-dollar Wagner was back in 2000 when the company was a subsidiary of MastroNet. REAs President, Rob Lifson, and his former partner Bill Mastro, made headlines selling the PSA-8 card for $1.26 million just fifteen years after they bought it from Allan Ray for $25,000. Both men have handled more Wagner cards than any other dealers or auctioneers in the industry and when Lifson opened REA in 1991, he said he’d already handled “eleven T206 Wagners” including the PSA-8 example. Lifson and REA identify that card in the current catalog as the “most valuable and famous” Wagner due to the fact it was later sold to Arizona Diamondbacks owner Ken Kendrick in 2007 for $2.8 million. Lifson and REA, however, do not identify that card as the highest graded Wagner with its PSA-8 designation because Mastro recently admitted in a plea agreement that he fraudulently trimmed the card to enhance its condition and value. The Federal Government indicted Mastro in 2012 for mail fraud and also for fraudulently promoting and advertising the trimmed Wagner card as the finest example known. REA’s Rob Lifson also fraudulently promoted the trimmed Wagner when he and Mastro were partners at MastroNet in 2000. Lifson and Mastro together defrauded bidders and collector Brian Seigel who purchased the trimmed Wagner in the REA auction for $1.26 million. After the sale Seigel said he would not have purchased the card “without PSA’s seal of approval.” At the time of the sale, Lifson not only had full knowledge that Mastro had trimmed the Wagner, but sources claim that Lifson was also the majority owner of the card at the time of the sale having purchased the card at Christie’s in 1996 with his friend Michael Gidwitz for $641,000. Gidwitz has declined Hauls of Shame’s requests for comment about the claims regarding his ownership of the card with Lifson. Lifson and Mastro split three years after selling the fraudulent Wagner and in the years that followed Lifson was an informant against his ex-partner and was scheduled to appear as a Government witness in a trial that was scheduled for 2014. That trial, however, never occurred since all of the Mastro defendants accepted plea agreements and are currently awaiting sentencing in June. PSA issued a press release rejoicing in REA's million dollar sale of the trimmed Wagner in 2000 (left). REA's Brian Dwyer (right) says the owner of the fraudulent Wagner, Ken Kendrick (center), could still turn a profit on his card. Collectors Universe removed any mention of the fraudulent PSA-8 Wagner from all annual reports and SEC filings after the Mastro indictments in 2012, but PSA currently features the trimmed card on its website’s “record breakers” page noting SCP’s private sale to Kendrick. Highlighting the incestuous relationship between PSA and auction houses, that page also features an advertisement and link for REA’s current auction. 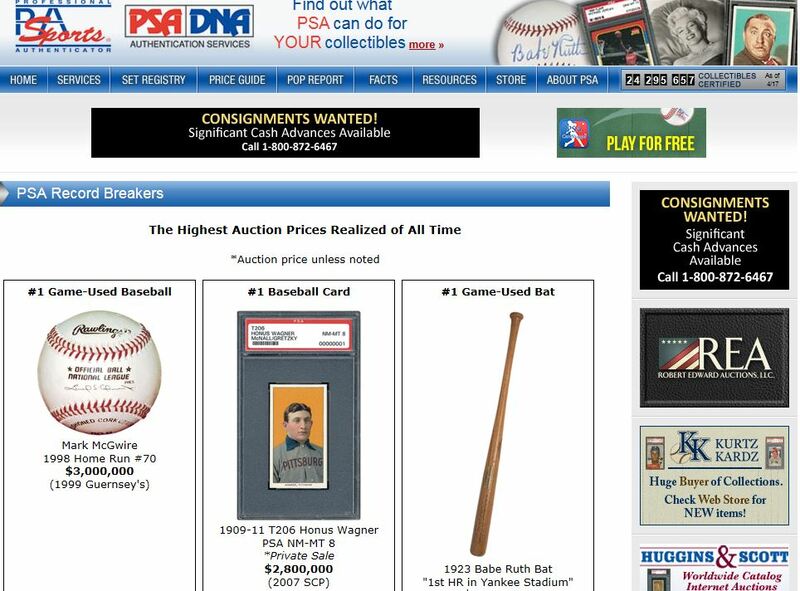 The current PSA website features the $2.8 million Wagner trimmed by Bill Mastro on the "PSA Record Breakers" page along with an advertisement for Robert Edward Auction's current sale. Despite speculating that the “Pearsall-Oceanside Wagner” would sell for $1.5 million and even $2 million on FOX Business News, REA’s Brian Dwyer and Rob Lifson couldn’t coax any buyers to bid on the card during the last day of the auction on April 25th and it sold for a hammer price of $1.1 million. With the buyers premium of 20% added on, an anonymous buyer snagged the card once owned by Frederick Tietz Jr. of Richmond Hill, Queens, for a total of $1.32 million. The price realized was very close to the sum that the trimmed and fraudulent “Gretzky-McNall Wagner” sold for at Robert Edward Auctions in 2000 when Lifson and his ex-partner Bill Mastro sold the altered card to unsuspecting collector Brian Seigel for $1.26 million. Just after REA closed out its 2015 Spring sale, a Federal Court Judge in Chicago announced this week that Bill Mastro is scheduled to be sentenced on August 20th. Court papers reveal that the sentencing is being scheduled now because Mastro waived his rights to contest the Government’s calculations of losses suffered by his victims of auction fraud and shill-bidding. No date was given by Judge Ronald Guzman for the sentencing of Mastro’s co-defendants. I don’t see why everybody has a problem with making pretty pictures to promote tobacco use. Peter, I’m continually amazed at the due diligance you do. Knowing the pedigree of all these items, when they sold, for how much, and to whom (often with photos and original articles!). You’re an invaluable resource. Thank you for your efforts! I’d rather have the REA Pearsall Wagner rather than the cut up card created by Mastro. You’d think a guy in Kendrick’s position wouldnt want to pass on a fraud to his kids as a legacy. Oh wait, he’s an MLB owner, what was I thinking? Can you imagine if Mr. Mint got away with it for 15K saying it was fake? He’d be in the Mastro house. I’m surprised he had it in a Long Island vault, the mob knocks out these vaults, try Park Avenue. You don’t mention if you reached out to Monsieur Mint for his recollections of offering $15K for a fake. Did you? The Wagner is up to $1.1 million. They say the camera adds 10 lbs….that must explain why WAGNER #2 (Top left, 2nd from left HOF one?) , his face looks Fat…. Maybe Wagner shared a meal with Kit Young and gained weight.